There's sapphires in them thar hills! 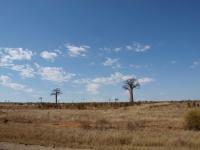 Today we continued on RN 7 about 230 km to Toliara, which is along the south-west coast. This is the first day we’re really getting into the Southern part of the country that Nathan remembers fondly from his youth. 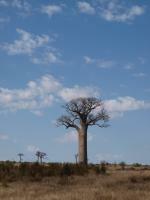 Toliara is one of the larger towns in the area where his family would sometimes visit or go for supplies. On one of those old Toliara junts, Nathan suffered a concussion due to a rogue stairwell. Come to think of it, that probably explains a lot. 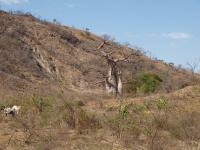 Today, we left at 8 am in Tony’s trusty Land Cruiser through more “western” landscape of sandstone cliffs and open savannah and then transitioned to a landscape of Baobob trees and “spiny forest.” This arid landscape is made up of fire- and drought-resistant flora that tend to be sharp and angular in appearance, hence seen as spiny. During the morning’s drive, we did stop at a small village to get a look at one of the local industries. We got a look at the process they use to mash sugarcane into juice, heating the result into a very strong local rum. We have pictures of the intense process, producing a brew that is sold in the villages bur considered too strong to sell legally in bigger towns and cities. 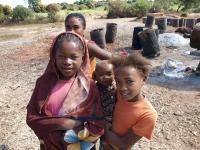 The people in the southern part of Madagascar are generally even more poor than those in other areas of the country. 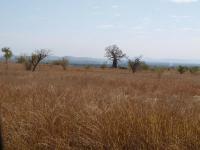 The climate is very dry, and although this area gets an equivalent amount of rainfall to more temperate regions (Paris was the example given), the fact that it usually comes in large doses and isn't spread out means that much of it runs off and is not available for crops and other vegetation. 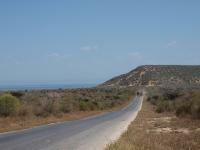 The roads in southern Madagascar are also generally poor, making transportation of goods, people and technology in and out of the area difficult. The combination of transportation and climate challenges contribute greatly to this area remaining among the poorest parts of the country. One result of this is that there is some rough (think bandits) country here. About midmorning we stopped on a rise just before a small town (I think it was Ilakaka) and were told we could take pictures from there, but that we would not be stopping in this town as it was not safe to do so. As we continued on, Tony used the automatic locks to secure all the doors. One of the things that adds to the “old west” feel to this area is the recent discovery of large sapphire deposits in the hills around Ilakaka. In fact this town has really just sprung up in the last decade in response to the “sapphire rush.” Unfortunately, there is little evidence that many Malagasy are benefiting much from the mining activities, particularly since the Malagasy are prohibited by the government from using any machinery to mine, but there are no such restrictions on the many foreign operators who have flocked to the area in the last decade. Thus, much of the potential income that would be such a boon to this area is flowing out of the country, rather then helping the local communities. Along the last hour or so of the road to Toliara there were several shops selling sapphires and other gems. These were some of the most impressive, solid and modern buildings by far that we saw along our route today. Quite a contrast with the wooden huts that most people along our drive were living in. A few of the villages seemed almost 100% made up of raw gem or jewelry sales shops. Around lunch time we arrived at the Arboretum d’Antsokay, about 30 km outside of Toliara. We armed ourselves for bugs and began a tour. We had a terrific local guide, with very good English and extensive knowledge of the local spiny forest flora. She did a great job of integrating both basic biological information and ethnological information of the traditional uses of the plants for medicines, building and other everyday uses. Among other specimens, we got good looks at octopus trees, euphorbia, pachypodium, baobab, baby baobab, dwarf baobab and false baobab. They also had examples of the local home styles of the three local tribes to broaden our ethnological capacities. After lunch at the arboretum’s cafe, we headed on to Toliara and our hotel, which was right on the water. The Hyppocampo is a relatively new boutique hotel in town run, as it turns out, by an older Italian couple who are to be found manning the bar and overseeing the kitchen at most times of day. The hotel itself is fairly small, with 10 rooms total, and has a European sense about it (reminding Nathan a bit of Fawlty Towers, in a good way). No restaurant as such but they have a small kitchen where they prepare a small changing menu for their guests at breakfast, lunch and dinner. Among other things, we had some fine fresh grilled fish during our stay. Most of the local staff seemed more comfortable with French or Italian than English so we did have a few challenges with communication but everyone was friendly so we muddled along. When we arrived, the tide was out - way out (most of the way to the horizon). By evening, the tide was back in and lapping up against the staircase that provided access to the shore. There are large mudflats in Toliara and although the tidal change difference is only a few feet, the very shallow mudflat areas make it seem that the tidal change is quite significant as the flats have vast areas exposed at low tide. Before dinner, We went exploring a bit along the edge of the mudflats, noting several boats seemingly marooned by the tidal change - resting on the mudflats and waiting until the tide comes in to move along. While wandering the area, we met some local youths. Christy also discovered a number of small crabs scurrying along the sand/mud and popping in and out of their burrows (small holes) in the sand. After a fine European meal and a beautiful sunset, we collapsed for sleep.